FAST Response for: Toronto, Etobicoke, Mississauga, York, North York, Vaughan & surrounding areas! Gas is an efficient and clean fuel. Water heaters, furnaces, stoves, grills, clothes dryers and fireplaces are some of the common appliances in households powered by this fuel source. Intercity Heating and Cooling has extensive experience with gas line installation, testing and repair in the Toronto area (including surrounding areas such as Etobicoke, Mississauga, York, North York and Vaughan). 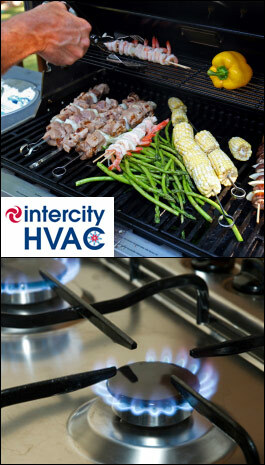 Intercity Heating and Cooling knows the unmatched pleasure of a grilled meal on a summer evening. But grilling can be a hassle when your propane tank runs out right in the middle of meal preparation while your guests are ready to eat! Consider a Gas Line Barbeque! That same steak or seafood prepared on a gas line Barbeque tastes like one prepared on a propane barbeque - without the hassle and inconvenience of propane. Call us to find out about hassle free Gas Barbeque today! Trying to work on your home lines if you are not trained can prove to be a costly mistake. Incorrect installation, testing and repairs can even lead to dangerous consequences - nobody wants that! Trust the expertise of Intercity Heating and Cooling and keep your house up to code and your family safe. Our skilled fitters and plumbers have the experience needed to take care of all of your needs, and we work in your home as if it were our very own. Additionally, our unmatched dedication to customer satisfaction ensures you will be completely happy with Intercity Heating and Cooling services. It isn't just our mission statement - it is our every day way of life. Schedule a FREE Evaluation / Estimate! Toronto, Etobicoke, Mississauga, York, North York, Vaughan and more!